Contributions made by our ancestors are abundant and far-reaching. I have noted a few examples below. The Abbot family left some monuments, Abbot Hall, on the Abbot campus at Phillips-Andover Academy, and Abbot Hall on the campus of Phillips-Exeter Academy, New Hampshire. Our ancestor "Mrs. Sarah (Abbot) Abbott, of Andover, Massachusetts, became the founder of Abbot Academy, February 26, 1829, the first school exclusively endowed for girls in the country." "She was the great-great-granddaughter of George Abbot. "(11) It became part of Philips Academy in 1973. Many of Andover’s fine programs are seeded with Abbot Academy Association monies. Academy Hill Historic District“Situated on a hill somewhat removed from the town,” the Academy Hill are has often been likened to “a small village within itself.” Academy Hill includes three separate educational institutions with their associate residential buildings. Unusually dynamic and influential, the schools have played an integral part in American educational history as well as in town development, and they display an outstanding collection of architecture. Benjamin Abbot, born in 1762, “graduated from Harvard in 1788." He lived in Exeter, New Hampshire and was the "second Principal of the Phillips Exeter Academy, and with him was its real beginning." "He found a school few in numbers and backward in scholarship, but soon new students could not be accommodated. The life he infused made the Academy celebrated." "Under his guidance the school prospered. In six years the little schoolhouse became too small, and a new building erected." "This ancestor is described as a man of heroic courage, who, with his wife, endured with Christian fortitude the many privations and hardships incident to a frontier life." "The eldest son of each of the following five generations was born and died on the same farm. Each bore the name of John." "On Sunday morning and evening the family sung a psalm or hymn before prayers, this old custom of the Abbot family was observed through many generations." "Three of his sons went to Harvard College." "John, the eldest, for fourteen years was a professor, and for twenty-four years was the Librarian, at Bowdoin College" in Maine. "He was also Treasurer and Fellow of the same college." "Abiel Abbot, another son was an assistant instructor in the Phillips Exeter Academy, he afterwards became a successful preacher." The third son was Benjamin, the subject of this sketch. "No one, however, could have assigned to him a life so full of rare service, nor have imagined that he was to mould the minds of so many who would later become great men." "Indeed, the whole history of his connection with the Academy is a comment on the necessity of good manners." "Dr. Abbot proved a model teacher. He was a scholar, and knew how to impart what he had learned." "His rare presence was fitted to command the respect of his neighbors and the obedience and love of his pupils." "Tall, broad-shouldered, and fine-looking, his graceful movements render it impossible for one soon to forget him. Sweetness and gentleness beam from his very eyes." "He was always a gentleman, even to the youngest of his pupils, inspiring them with high-mindedness and courage to do right. "Thus he walked about the village, repelling none by his dignity, but winning the esteem of every one by his genuine kindness." "He was not content to sit by the roadside, a wondering spectator, while the grand procession moved on. He did not, like some men, merely mark time, but he fell into line and marched." "Prevented by his continuous duties from seeing much of the great world, he was nevertheless emphatically a live man. His knowledge came gushing up from the overflowing depths of his own being." 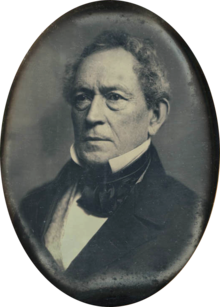 "In 1838, when Dr. Abbot had completed a term of fifty years' service, he resigned his position as Principal." At his retirement dinner, attended by "over three hundred former students and friends." A toast was offered by Daniel Webster, [a former student, other famous former students include Lewis Cass and Edward Everett] who presided, "Good health and long life to Preceptor Abbot," "which, as may well be supposed, was received with loud and continued applause." "When at length the venerable teacher was about to retire from the room, the entire company rose, as they did of old when he retired from the school-room, and cheer after cheer made the arches of the old church ring as they had never done before." "Dr. Abbot's grave may be found in the new cemetery at Exeter," New Hampshire. Nathaniel A. Haven, a former student, wrote: "Boys and gray haired men, new and old scholars of Exeter, let not his grave be neglected. Go to it as that of a hero; care for it as that of a nobleman; venerate it as that of a saint. Above all, remember the life and work of Dr. Abbot."